Lavinia Jean Valentine, 51, of Topeka, passed away on Monday, November 12, 2018. She was born August 19, 1967 in Omaha, Nebraska, the daughter of Jo Ann Valentine. 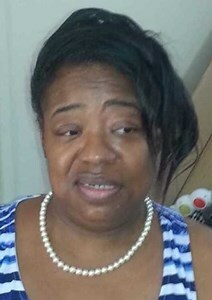 Survivors include her children, Jasmine Valentine, Joseph Valentine, Ta'Qweishya Valentine and Lavette Valentine, seven grandchildren and her siblings, Lynn Williams and Kevin Valentine. Lavinia was preceded in death by her mother, Jo Ann Valentine and one son, Eddie Valentine. Memorial services will be held at 10:30 a.m. Friday, November 23, 2018 at Dove Southeast Chapel. Private inurnment will take place at a later date. Add your memories to the guest book of Lavinia Valentine. I took care of Lavinia at Tanglewood and I loved her so much she was a wonderful lady. I still can’t believe she is gone. I miss going to her room and her listening to her gospel music and just bobbing her head she would get down to her music. Her laugh was contagious she would lite up any room. I miss seeing her every Monday and Thursday rolling her self outta her room to go to Bingo which she loved and adored. She will be greatly missed. I’m sorry for your loss and she will always be in my heart. A beautiful soul took to soon. Sister, my biggest regret was not being allowed to see you in your time of need. I have fond memories of you that I will never forget. Just remember, you hold a very special place in my heart. Say, hello to Mom and Eddie for me. I love you, forever. Although we don’t have many memories together I do remember the few times we spent together. You never told me no! To my older cousins, my condolences. To my Aunts and Dad stay strong. Love you all. EVEN THOUGH WE DIDN'T SEE EACH OTHER OFTEN , I ALWAYS KNEW YOU TO BE A HAPPY GO - LUCKY PERSON .. NO MATTER. YOU HAD A SMILE TO LIGJT UP THE WHOLE ROOM. I LOVE ?? ?? ?? YOU DEARLY , AMD WILL MISS YOU EVEN MORE. LOVE YOU ?? MISS YOU ? ?